When the VC10 was still new, the flight test crews at Vickers were the first ones to experience what the VC10 was like to fly (in). In many different tests all the aspects of the new design were evaluated and this led to some unique situations that a regular airline pilot would hopefully never have to experience. The stories below are all related to these early days at Weybridge and Wisley, Vickers' own flight test centre a few miles down the A3. 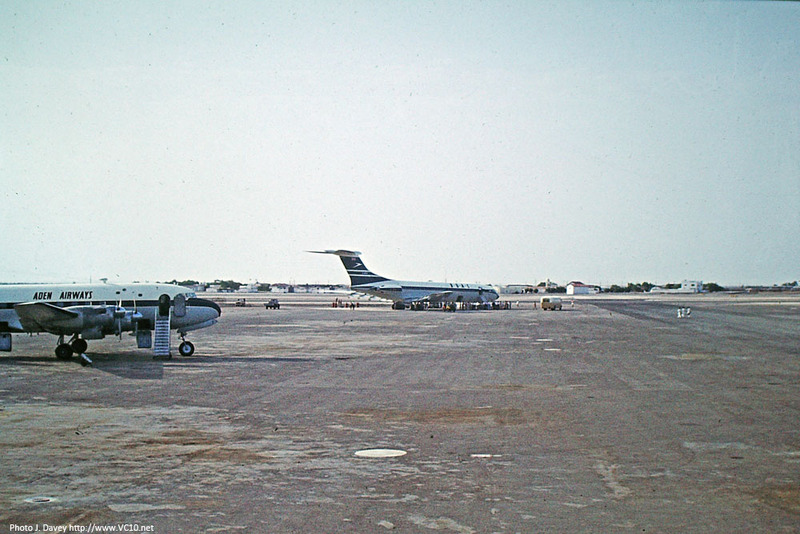 Next to these two locations VC10s also traveled widely to find ideal locations for specific tests, such as high temperatures, high airfield elevations or both. John Cannell sent in the following paragraphs about his time with Vickers Armstrong. His revelations about the escape hatches on the VC10 prototype provide an interesting insight in the dangers of flight testing. "I worked for Vickers Armstrongs (Aircraft) Ltd (later BAC) from 1958 to 1963 and the department I liked best during my apprenticeship was the Wind Tunnel. The first three aircraft had escape hatches for the flight test crew and one of my jobs was to help the photographer with his high speed cine-film photographs of simulated escapes from a model in the 13' x 9' tunnel. I pulled the string which released a model man who was then photographed, something that we did for various speeds and attitudes. All was well except for one particular combination and one hatch (the one forward on the side), when the man flew into the engine. We did that test again and he hit the tailplane. At the third attempt he just caught the wing downwash and went safely below the engines. Some time later I asked the photographer what the flight test crew said when they saw the film. He told me that he had cut that bit out and only showed the safe exit as he didn't want to worry them! I never did find out whether he was pulling my leg or whether he really did edit the film." Well, things could have been worse! On the subject of escape hatches I couldn't resist adding the following lines from Brian Trubshaw's 1998 autobiography 'Test Pilot'. In these lines Brian Trubshaw recalls one of the stall tests that he carried out with the prototype G-ARTA when things didn't go as planned. There is also some information about this flight on the Incidents and Accidents page, including some comments from an ex-Vickers ground crew member. "The last day of 1963 nearly brought the stalling programme to an abrupt end. I was just recovering from a clean stall when at about 250 Kts all hell broke loose as G-ARTA started shaking violently. There was a shout from the Senior Observer, Chris Mullen, who was looking at the tail through his periscope, 'Right inner elevator'. I was quite certain that G-ARTA was going to come apart and it nearly did, so I fired the escape hatch door and ordered the crew to bale out. The flight engineer, Roy Mole, could not get out of his seat and the same applied to the co-pilot Captain Peter Cane of BOAC, while the crew in the back could not hear me above the general racket. I managed to reduce speed to about 160 Kts which put me very close to a pre-stall buffet, whereupon the violent vibrations and oscillations calmed down to a smaller amount. The escape hatch chute which went through the front forward hold had collapsed and gone out when the door was jettisoned, so it was as well nobody tried to use it and only a jangled bunch of metal remained. I made a very gentle return towards Wisley under Mayday conditions and soon realized that I had lost half the aircraft services. However, the split system principle worked very well but I had to free-fall the right landing gear. After flight inspection revealed that the two right-hand engines had rotated 2 inch and in doing so pulled off hydraulic pipes and air-conditioning pipes. The right inner elevator had broken its attachment bracket which had set up flutter of that surface. 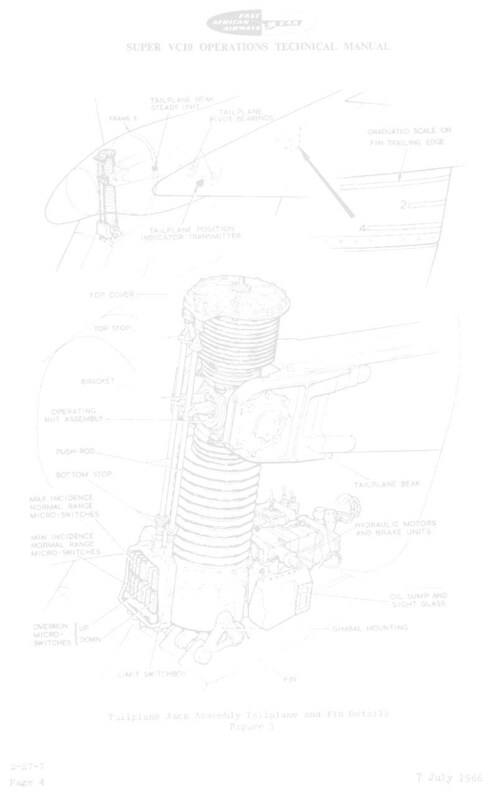 Two fin attachment bolts were severed. In fact poor G-ARTA with whom I had developed a great bond of affection was in a sorry state. I think that we had done about 2,300 stalls together." The type of escape hatch discussed above was fitted to both the VC10 and also to the BAC 1-11 (and perhaps other types of aircraft but I'm not sure about that). They consisted of a metal tunnel (the escape chute) that slid down through the forward freight hold to extend down below the aircraft through the freight hold door aperture after the door was removed using explosive bolts. Whether this would have provided a safe exit for the flight crew is a debatable issue, especially when the stories above are taken into account. The BAC 1-11 prototype G-ASHG was lost in October 1963 - just months before the incident with G-ARTA - when it got itself into a stable stalled condition and the flight crew did not have enough elevator authority left to regain control. The escape system was fired but the aircraft hit the ground shortly after the freight hold door was explosively removed. The flight test crew of seven did not survive the accident. 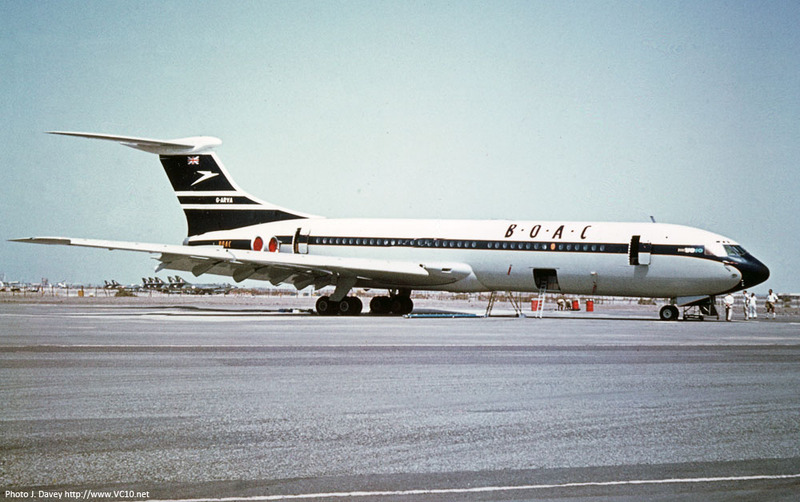 Michael Williams was closely involved with the development of the VC10 during his time as an avionic inspector for BAC. This is his account of one of the many test flights that took place from Wisley. "As an avionic inspector, on occasions I used to accompany test flights from the BAC Flight Test Centre at Wisley. This is my account of one of those occasions. 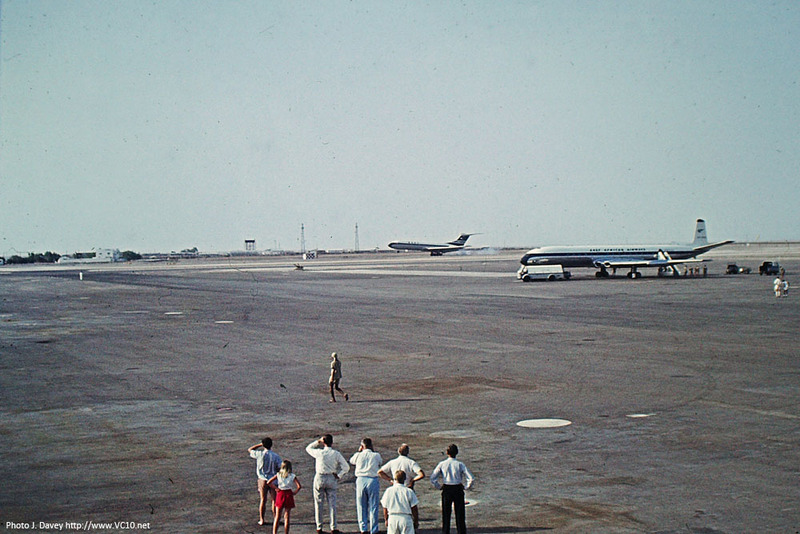 One Sunday morning in the mid 60s we took off in the brand new Super VC10. The first destination was London Heathrow, a short distance away. We followed the Kingston Bypass at a very low altitude, the Tolworth Tower seemed at our wing tip. It must have been a lovely sight from the ground. However, we arrived at LHR and carried out some automatic landings. The autopilot was quite an advanced system for those days, and was the programme in which was I most involved. The landings were carried out satisfactorily, the only problem being a small 'blip' on runway 28R glideslope's signal that upset the computer system a little. Having completed those tests we headed West to do some 'stalling'. Upon leaving London and still very low I was amazed to see out of the window, parachutes falling all around us! We had flown right through The Aldershot Military Tattoo. I never did find out what the people on the ground had to say about it. The authorities had warned all local aerodromes of the activity except Wisley. - Because they never fly on a Sunday! Now safely in the West Country (of England) and at 42,000 feet we were ready to commence our stall. Clearance had been given from ground control and we were told no aircraft were within 10 miles of us. I was on the flight deck, and the pilot asked me if I could identify an aircraft below us. I said 'Yes a Hawker Hunter'. He said either I had very good eyesight or the aircraft was a lot nearer than 10 miles. So the first attempt at a stall was aborted. Finally, a lovely smooth stall was carried out and we returned to Wisley in the late afternoon. All I had to do now was fill in my 'test flight expense form'. I could claim 15 shillings (75P.) I was never sure but I think this was to purchase extra life insurance." George Stevenson has been involved in the design of the VC10's unique air conditioning system and initially this earned him a seat on a test flight out of Wisley. 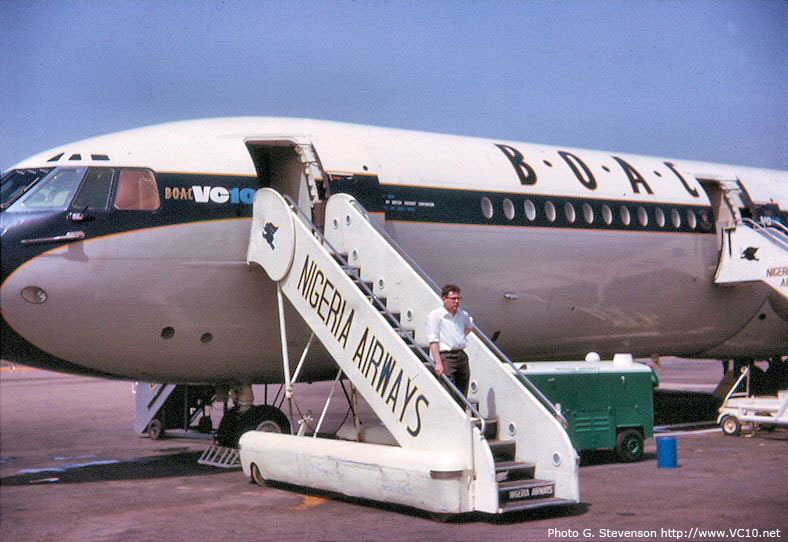 An extra route-proving flight to Nigeria to test some aspects of the air conditioning meant that he got a day trip to Nigeria! "It's good to see so much interest in the VC10. 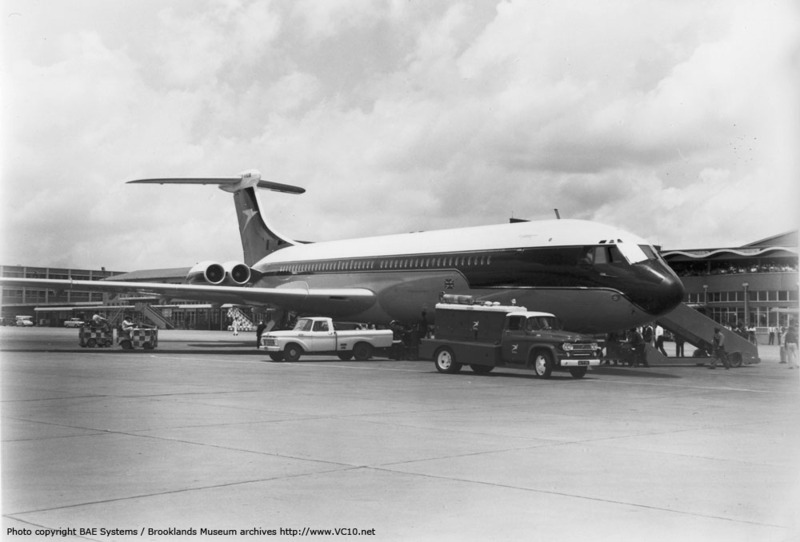 I became involved in the design of the air-conditioning equipment for the VC10 in 1960 and after that with the changes made for the Super VC10. The aircraft entered my life again just before I retired in 1994 when we were investigating how to update the refrigerant with a non-CFC type. This was because the RAF was extending the VC10's life with the tanker versions. I saw some of the conversions underway at Filton. Some of the aircraft used had been sitting out on airfields unused for several years. The transformation was remarkable. I flew on a test flight from Wisley during 1963. I think that was in G-ARVC. 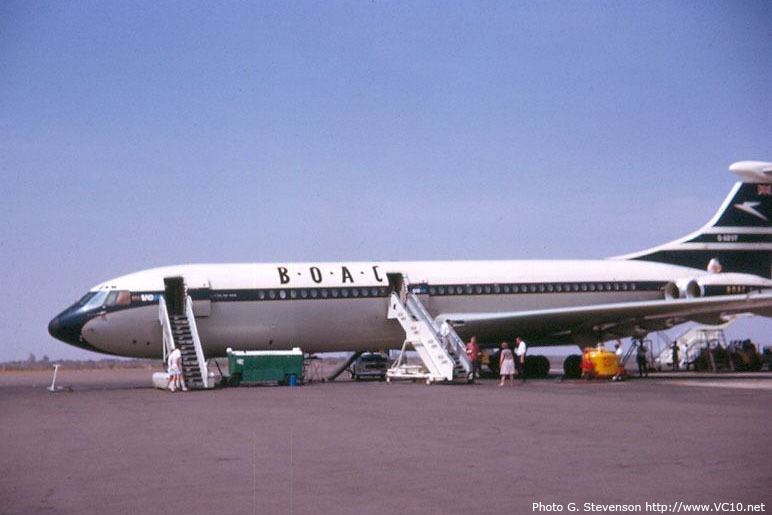 In April 1964 flew in the last route proving flight before the aircraft entered service. That was with G-ARVF. This flight to Kano and back has always been remembered as my day trip to Nigeria. 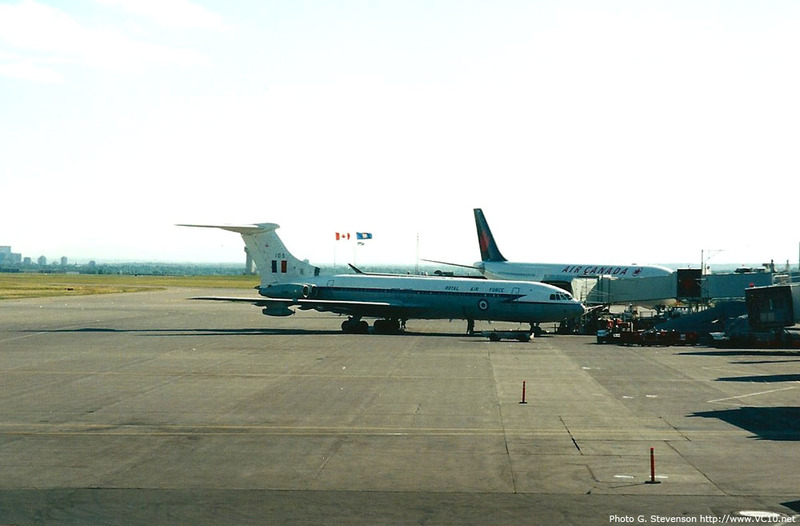 My last glimpse of the VC10 was an RAF aircraft at Calgary airport in the summer of 1997. 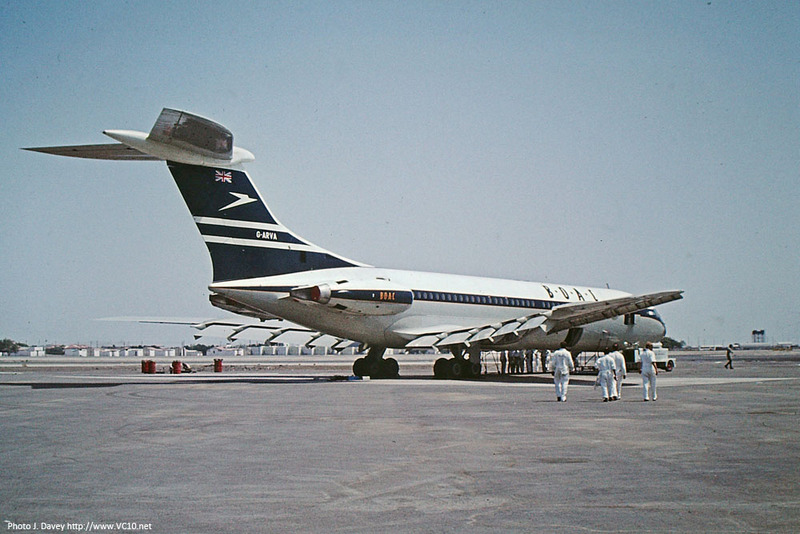 It is just possible that the high pitched whine noted by Ronnie in 'How to spot a VC10' was caused by the Godfrey screw compressors fitted to the RR Conway engines. These provided the cabin air supply. " The author descending the steps from G-ARVF during route proving. 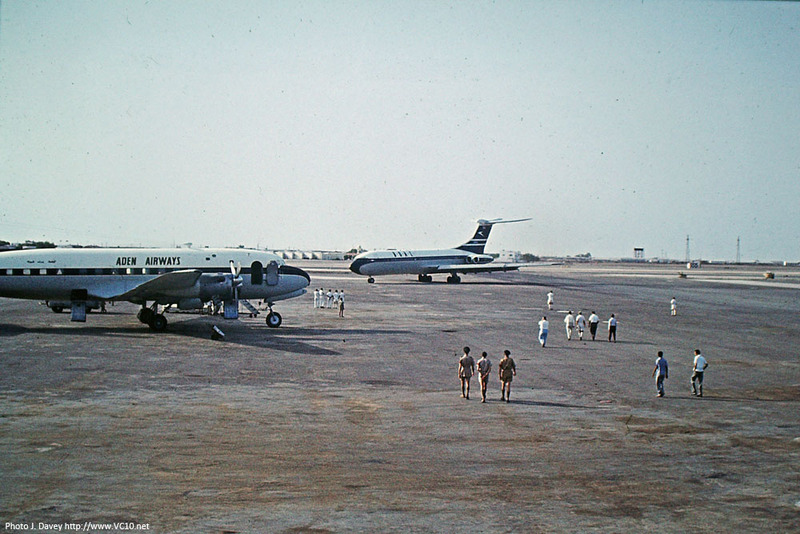 The tail of G-ARVF at Kano, Nigeria in 1964. A more recent sighting: XV105 seen at Calgary, Canada in 1997. 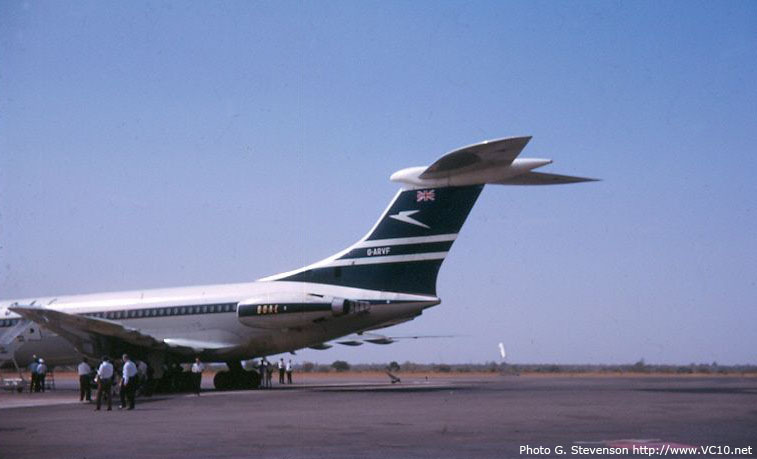 Ivor Horton worked for IBM and although that company isn't often associated with the VC10, he was an important part of the tropical trials in Johannesburg. "I enjoyed your very detailed record of the trials in Jo'burg in 1965. I was a 'guest' on the flight as I worked for IBM at the time. I recall that my wife was somewhat concerned that I needed special life insurance to go on the flight because there was no C of A I understood. I remember a few things about the flight. There was a dinner at Heathrow before we left. The seating was rather spartan on the aircraft to say the least - sort of canvas jump seats - with most of the interior taken up with technical equipment. I vaguely recall that the takeoff was rather long on the runway - I remember someone said the reason was that the aircraft was overweight. I was told that the intention was to simulate a full passenger load for the non-stop flight but it was said there was far too much ballast on board. The decision to land in Rhodesia seemed to be taken fairly late. It seemed to be a very steep landing approach to me - but then my previous experience of flying on a jet aircraft was nil. The takeoff also seemed to be remarkably steep and rapid but maybe this was Bill Cairns' flying style, or perhaps he was just in a hurry to reach the destination. I was asked to go along to handle processing of the kinetheodolite data that recorded the behaviour of the aircraft during take-offs and landings. The IBM data centre in Johannesburg was the only place where processing of the test data could be done. I was needed to ensure that the data processing worked - if there were problems it could delay the test program. The analysis for each day's testing had to be done overnight and the results were essential to determine whether the days testing was satisfactory, and could affect the testing program for the next day if they were not. The kinetheodolite produced punched paper tape containing angle and azimuth data for the device at fixed time intervals while recording the aircraft on film. Each frame on the film was analyzed to determine the position and attitude of the aircraft within the frame by recording the relative coordinates of fixed points on the aircraft. The computer program combined this data with the data on tape from the kinetheodolite to calculate the velocity, acceleration and rotation of the aircraft. My job was basically loafing around all day until the testing finished, then spending half the night processing the data for the test engineers. The reason I was necessary was that the program ran on an IBM 1401, which was a commercial system not designed for scientific and engineering work. Further the program written by someone I cannot recall was sparsely documented. I guess if things hadn't worked out I would have had to produce a new program... I was there for 6 weeks in all, after which the data processing was stable enough to be handled by local IBM people. I flew home on a commercial flight that seemed to take forever, landing to refuel in Luanda, where disturbingly the airfield was ringed with armed soldiers. As an aside I was also involved peripherally in the structural analysis for the VC10. I can't remember exactly but it might have been for the tanker version. The analysis was being done in-house at Weybridge on a Ferranti Pegasus I think, and it took literally days to do the calculation. Computer use in BAC was in its infancy then and the computation was not regarded as essential - just a confirmation of the design engineers slide rule calculations or rule of thumb design parameters. There was a reluctance to spend money on this at the time as it was not seen as important. The results of the Pegasus calculation seemed to have some problems, which is how I got involved. There was an IBM 7090 scientific computer in the IBM data centre in London. I suggested to the stress engineer, Ranjit Bhagat I think his name was, that we could rewrite the program for the 7090. The Pegasus program was written in a low-level language and had taken months, if not years to write and text. I proposed rewriting the computation for the 7090 in a week. We did this in Fortran well within the week as well as producing a program to calculate the moments of inertia(MI) for the fuselage structural frames within the same timeframe. These had been calculated by hand previously. It had taken more than a year and they were mostly incorrect. We recreated the correct MIs in one day, including writing and testing the program. The structural analysis computation took around 10 minutes and confirmed that the design engineers for the structural components had not got anything wrong. Ranjit Bhagat subsequently applied for, and got, a job with IBM." John Davey spent his childhood and school days at Aden, Yemen. In 1963 he was at the civil airport when he spotted something he had not seen before. I was at school in 1962/3 and we had the afternoons off so my friends and I were usually found at the civil airport two or three times a week. On the 12th August 1963 we had a quiet afternoon and were about to leave when some 'well dressed' VIPs started to walk from the terminal out to the parking stands. We thought they were going to the EAA Comet that was parked at the far end of the apron but they stopped after a few yards. After a few minutes we could see an unusual shape on finals and realised that it was a VC10. What a surprise that was, we had only seen pictures in magazines. So we stayed, as you would. The aircraft touched down and taxied to the parking stand opposite the Comet and the VIPs and crew introduced themselves. After a few minutes we had to leave to catch our bus home. Two days later on the 14th we were again at the airport and relieved to see that the VC10 was still based there. We had got friendly with the airport supervisor and asked if we could go onto the apron to take some photos. As it wasn't too busy he agreed. (You couldn't do that now!). While walking around the aircraft it was noticeably bigger compared to the usual residents and visitors and what a wonderful sight with the 'T' tail, 4 rear engines and swept wings. The engineers in their white flying suits were going in and out and setting up for the trials. One asked us if we would like to go inside. Well we didn't need asking twice and were up the steps in a couple of bounds. From what I could remember there were a few seats at the front and some test equipment further down. I wish I had taken more notice and some photos. If I remember correctly it was due to stay for one week doing trials. Our visit was over too soon and we made our way back to the viewing gallery at the terminal after thanking the supervisor for allowing us to be on the apron. Then we left and that was the last we saw of G-ARVA until I saw it again at Heathrow in service with BOAC colours. The stories below were related to me by Ian Kirby, ex VC10 flight engineer. 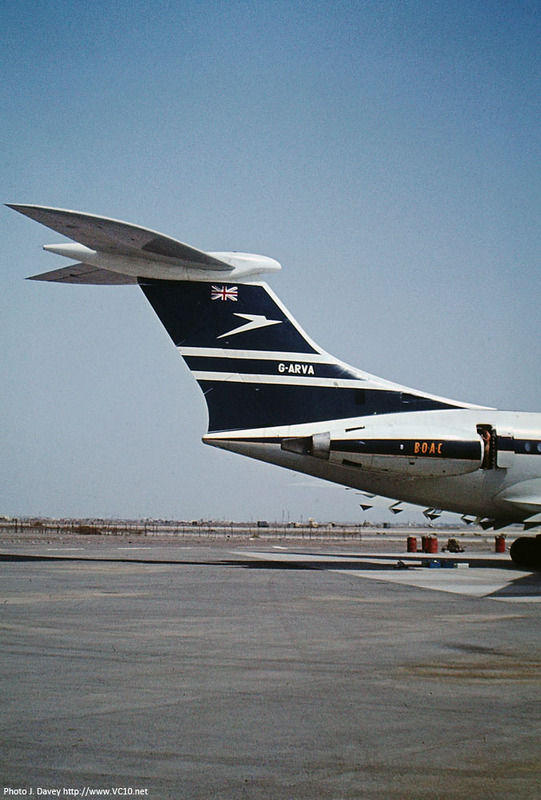 He worked for Vickers during the period when testing VC10s was a daily task. The Brooklands runway was initially considered on the short side for a VC10 takeoff, however once G-ARTA had been completed most of the doubts about this had been removed and on 29 June 1962 Jock Bryce proved that there was plenty of room for a VC10 to leave Brooklands. 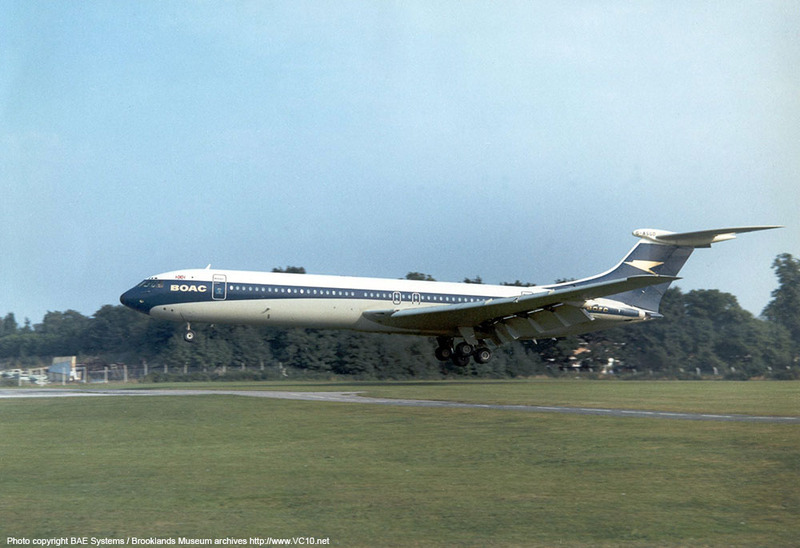 By 1963 there were several jobs that necessitated VC10s returning to Brooklands and it did not take long before a VC10 landed successfully back at its birthplace. This procedure did include some additional risks that were not present with landings at other airfields. For example the railway embankment at the Northern end meant that all landings were carried out from the South end, just like all take offs were accomplished in the opposite direction. Another thing that wasn’t very wise was landing long, or in layman’s terms: touching down far beyond the threshold, as there would most likely be insufficient room to stop and a go-around should be done in a timely fashion to avoid said railway embankment. The Vickers test pilots, as most pilots would have done, took on this challenge of not landing too far beyond the threshold and created a friendly competition out of it. Basically the aim was to land as close to the edge as possible, both to leave enough room to stop but also to show that you were just that little bit better than your colleagues. The South end of the Brooklands runway came up to the perimeter path and cycle track that ran from one side of the airfield to the other. As the runway and path surface were slightly higher than the grass, a slope was constructed just before the path to allow for an early touchdown. It was Eddie MacNamara who landed Super VC10 G-ASGD back on the runway it had left on 29 September 1964 and while doing so knowingly or perhaps unknowingly managed to set a new benchmark in the test pilots challenge. After the arrival he was taken out to the runway end so that he could view where the telltale rubber marks started on the runway surface. He agreed that this had been very, very close to being out of bounds. Eddie MacNamara bringing G-ASGD back to Brooklands, skimming the grass in front of the runway edge. Test pilots were and still are a special breed of pilots in some respects. The Brooklands runway challenge was not the only occasion on which they operated close to the edge of what was possible with an aircraft. John Cochrane had at one point been reprimanded for turning a VC10 away from the runway at such a low height after take off that one wingtip had grazed the grass next to the Wisley runway leaving green marks on the wing tip. With such an incident ‘on the books’ it would of course be wise to avoid any situations that could lead to further reprimands and perhaps a change of employer. It was an observer who explained later on that sometime during the test flight, the aircraft was put into a low-level steep turn for a very specific purpose: two ladies were sunning themselves in a field.